Charlie Sheen reportedly flew off the handle with his ex-wife Denise Richards because she wouldn't let him take their daughters to Mexico. The 49-year-old actor has two girls with Denise (Sam) 11, and ten-year-old Lola. Their relationship has been varied over the years, flitting between Charlie publicly slamming her and the pair spending holidays together. Yesterday the former Two and a Half Men actor lashed out at his ex on Twitter, calling her a "washed up piglet" and the "worst mom alive" among other things. Now it's been claimed the outpouring could have been because Charlie wanted to take his kids on holiday at the last minute, but Denise ruled it out. "He acted out after being denied the outlandish request," a source told RadarOnline. "[His other ex-wife Brooke Mueller] is currently in Mexico and Charlie most likely wanted to join her down there." Charlie and Brooke have twin sons Bob and Max, six, but they also have a troubled past. Although he appears to be on good terms with her at the moment, in the past he has called on Denise to look after the little boys as he didn't think Brooke was able to do so properly. However, in yesterday's tweets - which have since been deleted - he praised Brooke. The messages came on Father's Day and Charlie also posted a missive about dad's rights, asking for justice for all men who wanted to spend time with their little ones. Denise took the comments in her stride, even though they have hit headlines all over the world. "Happy Dad's Day! 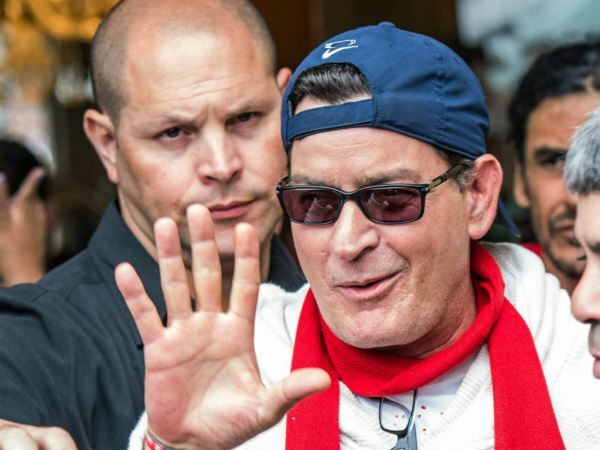 @charliesheen have a great trip in Mexico! Kids were disappointed u weren't here for it- Hey we'll celebrate when u r back! (sic)," she wrote. She is said to be looking for a new home at the moment, which will see her move away from Charlie's neighbourhood so her children can go to a new school. Denise has previously spoken about how difficult Charlie's outbursts can be. He was famously fired from Two and a Half Men after slamming the show's creator Chuck Lorre and shutting down production as he needed to go to rehab. All of that was hard for Denise to explain to her children. "As far as the media, I shield them completely, but there were a few things they would hear through other kids,” she explained in 2011. “I did have to have a conversation with them about addiction and got a book to read to them because I was just lying to them so much and covering up and telling lies, and it was just getting too confusing.